Teaching a dog to obey your commands is one of the great joys of dog ownership and is an excellent way to bond with your pet. One of the easiest commands to teach a dog is speak, where the dog responds to your command by barking. The speak command is often used as the foundation for more advanced tricks, and so should be mastered early on. Dogs learn quickly and efficiently, especially if you are prepared before training begins. Training is best done at home where distractions can be minimized. The dog park often will present too many distractions for both you and your pup. 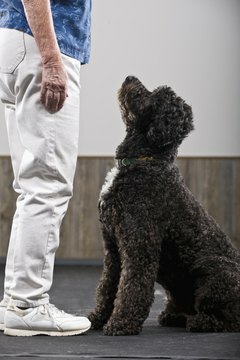 Having a pocket full of treats, ready to reward your dog, is essential in traditional reward-based training systems. If possible, begin teaching your dog commands and tricks while the puppy is still young. They will be able to learn better later in life if you start early. One way to teach your dog to speak is to start by getting your pet excited. Games such as tug-of-war and fetch are great for this step. Once your dog is energetic, present the pup a treat, then immediately hide it behind your back. If the dog whimpers or barks, encourage this behavior by giving him the treat. The next time, as you're hiding the treat, name the command by saying "Speak!" When the dog barks, reward the behavior again. Repeat this process and he will begin to make the association between the word and the behavior. Another way to teach your dog to speak is by using sounds your pet already has been conditioned to react to by barking. For many dogs, a sharp knock on the door or the ringing of the doorbell will provoke a bark. To perform this training method, give the command, knock on the door and reward your pet when she barks. Gradually fade out the knocking or doorbell. Dogs don't speak English, so sometimes they can confuse words that sound similar to them. To minimize this, match each new command you teach your pup with a corresponding hand signal. For speak, you can hold your hand like a mouth and open and close it rapidly by touching your thumb to your fingertips. Dogs also can be clicker trained -- that is, they can be trained to associate the sound of a small device called a clicker to mean they are doing something right. You can teach speak with a clicker as well. This can cut down on the amount of treats you have to feed your dog during training. Texas A&M, Veterinary Medicine and Biomedical Sciences: Training Tips for Dogs.